Rainn discusses his favorite roles, what it was like to be Dwight on The Office, the inspiration behind starting his media company and how his faith and family have shaped his life. Take this episode with you through iTunes or Spotify. Rainn Wilson is an Emmy Award nominated actor, producer, writer, director, author, husband, father, and philanthropist. You might know him from his role, playing Dwight from The Office, or by reading his autobiography, The Bassoon King, or you may follow his social media company, Soul Pancake, or listen to his amazing podcast. Which character Rainn would want to play in a movie remake. What inspired him to keep going in his early acting career, even when he wanted to quit. What the best thing was about playing Dwight in the iconic show The Office. 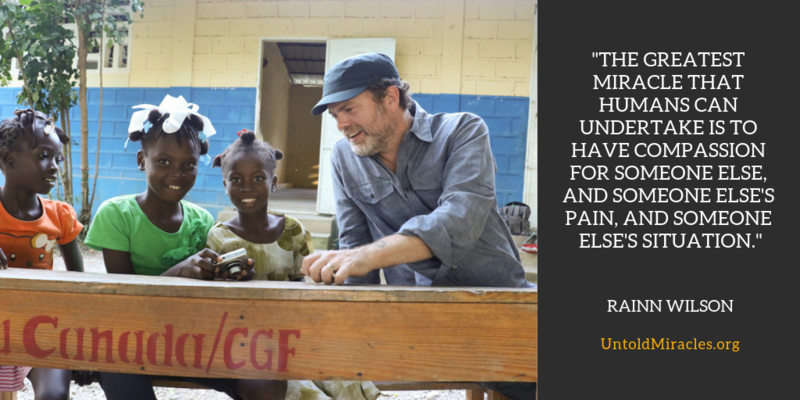 How Rainn supports a charity in Haiti that helps adolescent girls access greater educational opportunities. Who he would play Dungeons and Dragons with if he could play with anyone in the world. Why he believes that flawed people can still make a positive impact in the world. This episode is brought to you by Marriott International.